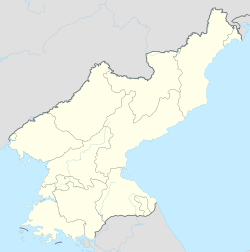 Anju-si (Korean pronunciation: [an.dzu]) is a city in the South P'yŏngan province of North Korea. Its population was 240,117 in 2008. The Ch'ongch'on River passes through Anju. Anju lies near large deposits of anthracite coal, and contains one of the largest coal production facilities in the country. The deposits contain more than 130 million metric tons of coal. Namhŭng-dong is the location of the Namhŭng Youth Chemical Complex, one of North Korea's most important chemical combines. Anju-si is served by several stations on the P'yŏngŭi and Kaech'ŏn lines of the Korean State Railway. ^ North Korea Handbook. M.E. Sharpe. 2003. ISBN 0765610043. Retrieved 2012-07-18. ^ Kuo, Chin S. (1994). "The mineral industry of North Korea" (PDF). Retrieved 2012-07-18. ^ Joseph S. Bermudez Jr. (10 April 2014). "North Korea's Namhung Youth Chemical Complex: Seven Years of Construction Pays Off". US-Korea Institute at SAIS. This page was last edited on 27 December 2018, at 13:50 (UTC).